Listen up alternative metal fans!! 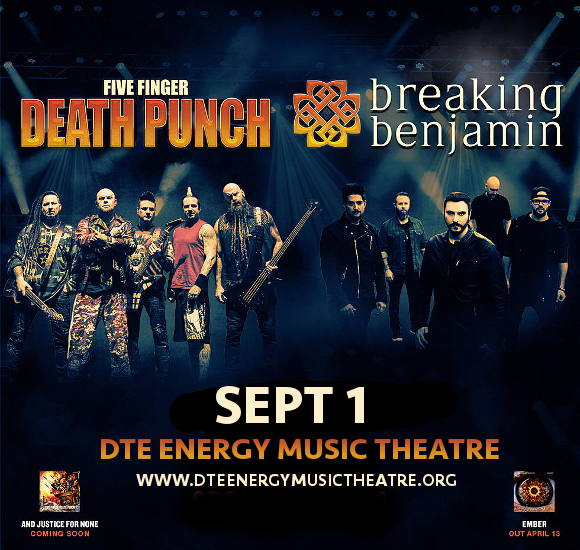 Groove metal giants Five Finger Death Punch are teaming up with post-grungers Breaking Benjamin for a HUGE co-headlining North American tour!! On Saturday 1st September 2018, they’re coming to Michigan’s DTE Energy Music Theatre!! Be there – grab your tickets for this massive show today while they last!! Kicking off in Seattle, the huge tour will stop at no less than 32 major North American cities, with some incredible support acts from names including Nothing More and Bad Wolves on select dates! "We are putting together 2018's biggest Hard Rock tour of the Summer; where even the first band on the bill has a massive hit single around the world,” enthused Five Finger Death Punch guitarist Zoltan Bathory when asked for a statement. “There will be fire, there will be lights and it's going to be loud. An experience you can't just download, you have to be there. We all get about 80 summers in our lifetimes, so make them count." The announcement of the tour comes along with the confirmation of a brand new album from Five Finger Death Punch, “And Justice For None,” due out May 18, while Breaking Benjamin have announced that fans can expect their sixth album, “Ember,” on April 23!! Be among the first to hear all the new material live – get your tickets NOW! !